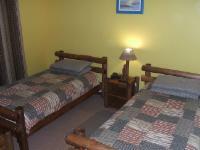 Downstairs twin single log beds, private seperate bathroom (shower, toilet, washbasin). Flat Screen LED TV & 17 Satellite Channels, heating and cooling, mini-safe, bar fri dge, tea/coffee facilities & radio/alarm clock. Can bring own DSTV decoder. Large upstairs room with 2 single beds. Private seperate bathroom (shower, toilet, washbasin). Flat Screen LED TV & 17 Satellite Channels,Aircon/heater, mini-safe, bar fridge, tea/coffee facilities & radio/alarm clock. Can bring own DSTV decoder. 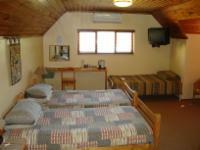 Large upstairs room , 3 single beds ,plus another adjoining double bunk-bed room. En- suite bathroom (shower, toilet, washbasin). Flat Screen TV & Sat Channels. 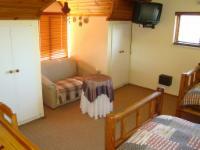 ,Aircon/heater, mini-safe, bar fridge, tea/coffee facilities & radio/alarm clock. If cancelling 7 days before arrival, forfeit 50% of the booking total. If cancelling 21 days before arrival, forfeit 25% of the booking total. If cancelling 60 days before arrival, forfeit 5% of the booking total. Bookings only confirmed on confirmation of 50% deposit payment. Balance payable on arrival. Check In Time: After 14:00 Check Out Time: Before 11:00 No DEBIT CARD payments ... Only Credit Cards Please note that guests paying by credit card are required to present a valid photo ID and the credit card upon check in. A valid drivers license, passport or ID are accepted forms of identification. Bookings where the guest is not the credit card holder will not be accepted unless the guest produces a copy of the credit card and a valid copy of the card holder's ID upon check in.